The Rezillos is a punk new wave band formed in Edinburgh, Scotland, in 1976. Although emerging at the same time as other bands in the punk rock movement, the Rezillos did not share the nihilism or social commentary of their contemporaries, instead took a more light-hearted approach to their songs, preferring to describe themselves at the time as a New Wave beat group. Released in July 1978, the Rezillos' only studio album Can't Stand the Rezillos is now considered a classic album of the first wave of British punk. 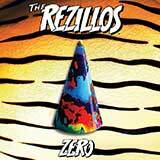 The Rezillos now return with ZERO, featuring twelve blistering tracks of swaggering punk rock. Touches of everything from Blondie and The B52s to The Cramps are reflected in the music, though thoroughly energized for today.